Lycoris is a small genus of bulbous plants known for their colorful and exceptionally beautiful flowers of all shades of pink, orange, red, white and yellow. They are quite easy to grow plants that just require a deep, rich and moist soil, with some warmth in summer. 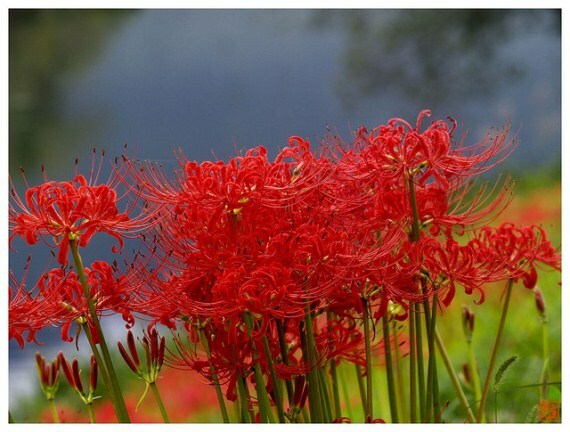 Most species of Lycoris belong to Japan, Korea, China and northern parts of Pakistan. Lycoris can be grown in containers but preferably in raised beds where they would often form large clumps of bulbous plants. As with other plants in the Lily family, flowers of Lycoris grown on long stalks making them good background plants in mix flower beds. Lycoris squamigera – A cold hardy plant with large pink flowers that appear in late summer. The plant is also known as Magic Lily, Surprise Lily or Resurrection Lily because its flowers appear after the leaves have totally disappear during the summer and flowers appear from seemingly dead bulbs. Lycoris sprengeri – Closely resembling Lycoris squamigera, L. sprengeri has smaller leaves and flowers. Common names of Lycoris sprengeri are Electric Blue Surprise Lily because the pink flowers have prominent and rich shade of ‘electric’ blue on tips of petals. Lycoris aurea – A popular bulbous plant with golden-yellow flowers often used as cut flowers. Lycoris radiate – Easy-to-grow plant and prolific plant producing large clumps in natural habitats. The plant is commonly known as Red Spider Lily because of its showy red flowers.